Bear Valley Springs residents voiced opinions for and against the water rate increase. Residents of Bear Valley Springs will soon see residential and commercial water rates increase over the next five years. The Bear Valley Community Services District board on Thursday night unanimously approved the increases to help operation revenues and fix aging infrastructure. More than 50 residents attended to voice their concerns. Base rates are expected to quadruple from the current rate by 2023, with residential rates starting at $25.33 and gradually raising to $84.74 per month, starting May 1. Residents also are subject to additional charges depending on the amount of water they consume. Resident Paul Benz, Jr. said, “Please table this and explore other options rather than putting everybody through a water rate increase.” He added that other options of raising money to pay for aging infrastructure can be considered, and the way it was announced to the public was not efficient. Operating expenses and the need to raise water rates was addressed in a 2019 Water System Rate Study by Willdan, an engineering consulting firm hired by the district, said William J. Malinen, general manager for BVCSD. “There were a number of goals to solidify the revenue for operating, to improve our reserve fund, to address what our requirements are for monies we had borrowed previously and to have some amount for some capital improvements,” said Malinen. In 2017, the district had revenues of $2,107,501 and expenses wee $2,034,248 , according to the study. A letter from the district was mailed to 2,913 residents who had a meter stating that written protests against the raise in rates should be submitted by mail or in person by April 11. More than 260 residents protested against the changes, with another 1,200 protests needed to stop the rate change. 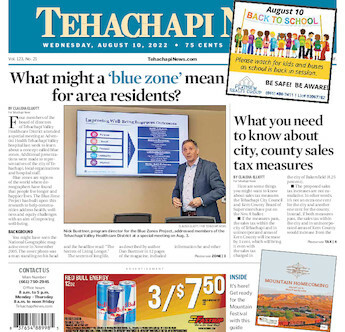 Recovery of 60 percent of revenues to operate the current water system, addressing the cost to pump groundwater and to purchase water from the Tehachapi Cummings-County Water District were other listed reasons for the increase. The district has more than “110 miles of pipelines, 36 booster stations to serve 19 different pressure zones, 26 weeks and 43 storage tanks. Much of the infrastructure for the water system dates back to the development of the Bear Valley Springs in the early 1970’s and needs to be repaired or replaced,” added the letter.